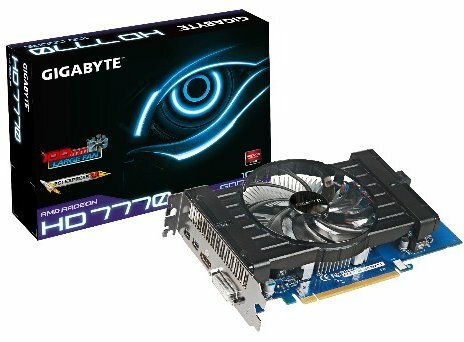 Gigabyte introduced its Radeon HD 7700 family with the GV-R777OC-1GD, GV-R777D5-1GD, and GV-R775OC-1GI. The Radeon HD 7750 OC model offers a 880MHz core and 4500MHz memory and the Radeon HD 7770 OC edition is overclocked to 1100MHz with 4500MHz memory. GIGABYTE Technology Co. LTD., a leading manufacturer of motherboards and graphics cards, is pleased to present AMD Radeon™ HD 7700 Series Graphics Cards: GV-R777OC-1GD, GV-R777D5-1GD, and GV-R775OC-1GI. Built with AMD’s latest 28nm GPU and GDDR5 memory, GIGABYTE makes these cards with higher core clock. GV-R777OC-1GD is especially overclocked to 1100 MHz! Equipped with GIGABYTE’s latest in-house cooling solution and adapted with GIGABYTE Ultra Durable 2 materials, GIGABYTE makes sure that Radeon HD 7700 Series is with the best speed of heat dissipation and performance. 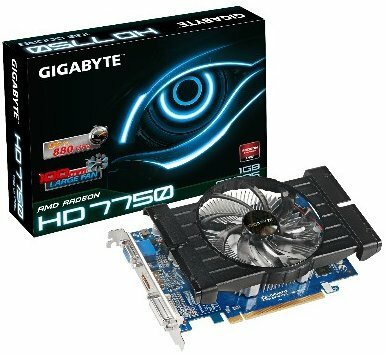 GIGABYTE Radeon HD 7700 Series also provides a number of innovative features including the latest AMD APP Acceleration, Microsoft DirectX® 11 supported, AMD HD3D, Crossfire™, and PCI-Express 3.0 supported. GIGABYTE GV-R777OC-1GD, GV-R777D5-1GD, and GV-R775OC-1GI guarantee gamers to have the best gaming experience with realistic visuals and fantastic gaming performance! GIGABYTE GV-R777OC-1GD is an Overclock Graphics Card. Not only built with AMD’s latest 28nm GPU and GDDR5, GIGABYTE overclocks this card to 1100 MHz core clock! GV-R777OC-1GD is designed specifically for overclocking competition and gaming battle. The powerful new GPU consists of ground-breaking features which lead to incredibly immersive HD gaming experience and unrivaled performance. GIGABYTE always dedicates to providing the best thermal solution to fulfill serious gamers’ needs. GIGABYTE Radeon HD 7700 Series is equipped with GIGABYTE 10cm large fan to provide gamers with a reliable gaming environment. Also, as opposed to the stereotype, GIGABYTE is able to maximize fan size to 10cm with the latest cooling design. Adapted with this 10cm cooling solution, GIGABYTE Radeon HD 7700 Series is virtually silent and its noise level only runs from 21.7dBA to 28dBA at full load. To fulfill every power gamer with no-compromise HD gaming experience, GIGABYTE AMD Radeon HD 7700 Series offers full support for Microsoft DirectX® 11 for realistic and stunning 3D gaming effects. Gamers are able to enjoy their favorite games in full stereo 3D with AMD HD3D technology which supports Stereo 3D display, gaming, and Blu-ray™. AMD HD3D technology brings gaming experience to a new levels of visual realism while gaming in PC. Using high quality components is the key factor for having a long lasting, stable and reliable graphics card. GIGABYTE is again setting a new standard by using Ferrite Core Chokes, Low RDS (on) MOSFET and Lower ESR Solid Capacitors to provide the stability and reliability for the high-end graphics solution. In addition, GIGABYTE Ultra Durable 2 Edition graphics cards now feature a sophisticated layout topology. This state-of-the-art power design from GIGABYTE delivers the ideal integration of thermal, electric characteristics, digital signals, power circuitry and optimum placement of components for enhanced graphics performance.